I'm a bit of an unashamed Sylvia Plath fan. I first read The Bell Jar when I was 13, and her life and journals are a constant source of real fascination for me. 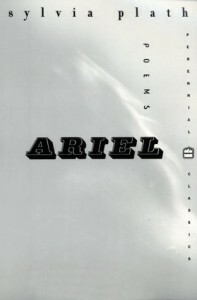 I hadn't, however, encountered any of her poetry outside of the parts of her journals I've read and so seeing this in my Uni library catalogue made me instantly grab the chance to read it.The poems that make up Ariel were discovered after Plath had committed suicide, and they're certainly not easy to read. Although there are moments of apparent happiness in some of the poems ("Letter in November"), overall I got a sense of melancholy from the collection; unsurprising when it is considered that she was separated from Ted Hughes at the time and effectively only months from taking her own life. Children permeate the poems, from those that revolve around them like "Morning Song" and "Nick & The Candlestick", to others where babies and children inspire certain images. Bees are also present, especially in the last few poems of the collection, with a special emphasis being made on the presence of women at the centre of the swarm. As with the first part of her journal that I've read, Plath also focuses quite a lot on being trapped in relationships; in "The Rabbit Catcher" she writes of 'the constriction killing me also" and in "The Applicant" the woman is described as a 'living doll'. Also, giving a hint of the state of her relationships is "The Rival" perhaps reflecting on Hughes' affair and the somewhat controversial "Daddy" which deals simultaneously with her relationship with her father and again with Hughes.Although Plath's poetry is chock-filled with imagery which you could spend an age trying to decipher, they can, I feel, be read without a great deal of analysis-she has a way with language that can put across moods really well. Reading Ariel has made me hope to return to reading her journals soon.